Burnout 3: Takedown is one of those games that ruins its genre. Not because it is a bad racing game, but rather because it is so fast and intense that it makes all other racing games seem slow and dull. When a game like this comes out, nothing else seems very fun any more. Burnout 3 raises the bar so high that its competitors can\'\'t even see it with a telescope. The concept of Burnout 3's main race mode isn't anything terribly original as far as arcade-style racers go: try to be first to the finish line while avoiding traffic and obstacles. The difference is that everything has been amped up to the extreme. The sense of blazing, barely-controlled speed is mind-blowing. The way lights smear across the screen as the raging mass of metal and rubber roars past them, and how sparks arc through air as a car skids through the oblivious, law-abiding traffic, makes the experience more heart pounding than anything else on four wheels. In order to win races, it is necessary to maximize acceleration using "boost", which is gained either by driving dangerously (drive in the oncoming lane, drift around corners, and etc...) or by taking out oponents by ramming them into walls or other cars. Controlling cars in Burnout 3 is never frustrating thanks to mercifully unrealistic (yet consistent) driving physics. The game manages to perfect the balance between the sensation of being on an unpredictable thrill ride and the feeling of being in control. The game is designed to keep you on the edge, and it succeeds splendidly. Then there are the crashes. Boy, are there crashes! Run into a wall or another vehicle and the player will be treated to some of the most amazing spectacle of destruction ever captured in the digital medium. Hunks of fire and steel dance across the screen while the player uses his or her limited control to steer gnarled core of the wreck into competing cars. After a few seconds, the player is automatically put back into the action with nothing lost but a few precious seconds. The flow of adrenalin never ends. There are several other play modes to keep you entertained if regular races get old (though they never do). Crash mode, which is extensive enough to be a separate game, has the player driving into a crowded intersection with the goal to create a crash worth as many dollars in property damage as possible. There are eliminator races, where the car in last place is eliminated after each lap until one is left, and a mode where the goal is to ram other cars off the road. 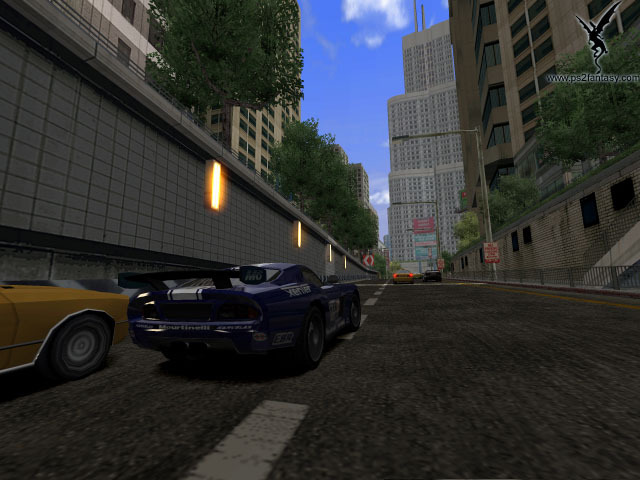 The game supports split-screen multi player and online play (something that Gran Turismo 4, the closest competitor for best racing game on the PS2, lacks). Perhaps the best part of Burnout 3 is how the player is constantly being rewarded. New cars, tracks, and events are constantly being unlocked, along with trophies and postcards. Do enough damage in crash mode and you\'\'ll even get to see the newspaper headline you\'\'ve made with all the carnage. There are only two things I wish were different in Burnout 3. First, the load times in Crash Mode can get annoying, and also the lack of liscensed cars hurts the experience. To be able to race with real cars instead of the generic ones included would have been sweet. Even so, Burnout 3 offers a premium game play experience that no one should miss, even if that someone isn\'\'t particularly a fan of racing games. If Burnout 3 succeeds in one thing graphically, it is with light. Sparks are always flying across the screen, street lamps blur across the screen, and the sunlight bounces off of metallic surfaces. As I have said before, the crashes are amazing. The amount of rubble filling the screen is fantastic, and the damage models for the cars are very well done. The frame rate never surrenders, which is a blessing in a game whose focus is speed. As long as the game is blazing along at full speed, the courses look very good. The environments are reasonably diverse, even if none of them seem particularly exotic. The palette is welcomely colorful; a nice change of passe from other street-racing games where the art tends toward dark skies and overly glossy streets. Unfortunately, when the screen isn't blurred from speed, some of the props, such as trees, start to look like cardboard cutouts. Even then, the world of Burnout 3 looks as crisp as anything on the PS2. Your eyes will never have want of stimulus during Burnout 3. The listeners soundtrack in Burnout 3 is filled with rock/punk/emo bands like Rise Against, Fallout Boy, and My Chemical Romance. Whether or not one likes that sort of thing, the modern rock music sets the mood of the game perfectly. Personality is something that a lot of racing games lack, but Burnout 3 is an exception, and it is mostly thanks to the rockin\'\' tunes blasting in the background. Burnout 3 also benefits from expert sound design. The screaming of the engine and squealing of rubber melting against pavement pushes players even closer to the edge of their seats. During crashes, the sound of tearing metal, especially when played in slow motion, brings a certain sense of drama that compliments the usual intensity of the racing. The DJ/commentator is both irritating and repetitive. Thankfully, he can be muted. Other than that the sound package, like the rest of Burnout 3, is brilliant.